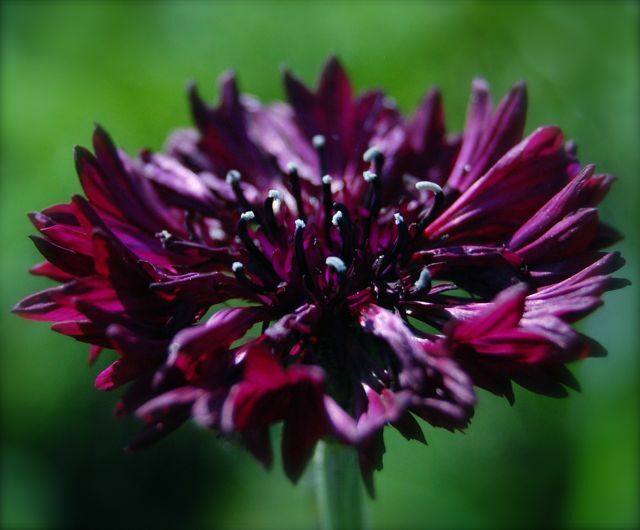 Grow Cornflower ‘Black Ball’ From Seed. Cornflower ‘Black Ball’ Direct sown in Mid April. Cornflowers will last five to seven days if you pick them just as the flowers are unfurling…they are simplicity itself and there is NO WAY I would ever be without them in the cutting patch. Not only are they super drop dead gorgeous but they are also ‘cut and come again’ and will keep producing flowers for yonks. Throw some into a jug or a jam jar for instant happiness! 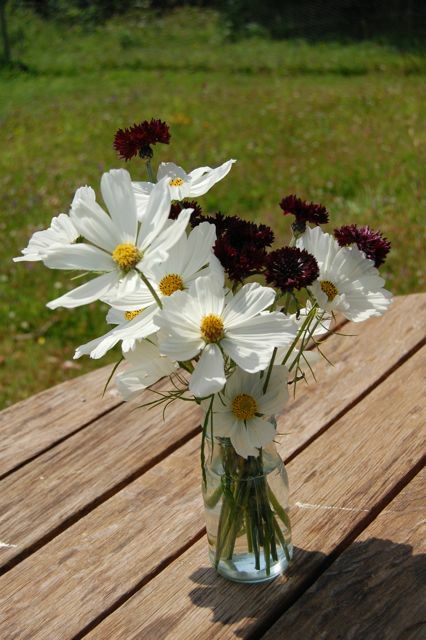 Here I have put them with the mighty Cosmos ‘Purity’ and I think they look wonderful. How To Grow Cornflower ‘Black Ball’ From Seed. *I make my first sowing direct into the soil from mid April…and then make a September sowing too for an early flowering the following year. *Cornflowers like plenty of sun…so find a bed that gets lots of rays. *Dig over and remove ALL weeds and rake it to a fine tilth. *I sow in straight drills…I use a taught piece of string a scratch a shallow drench…just a couple of millimetres. 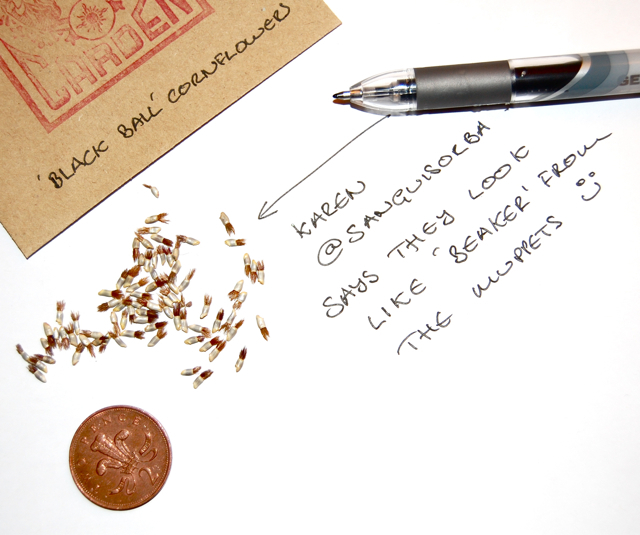 *Prewater the drill then add your seeds…one every couple of inches or so. 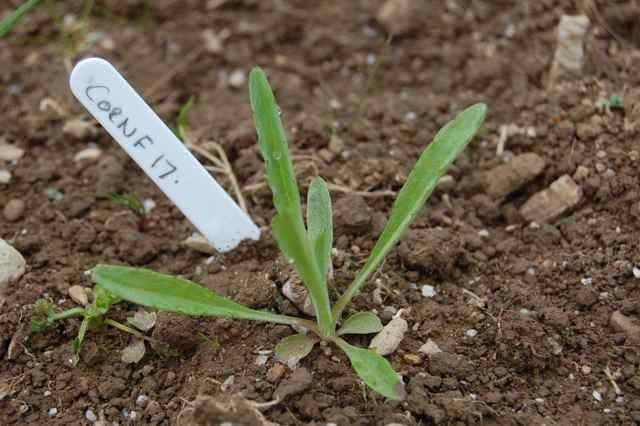 Cornflower seedling. Sown 17th April. *Germination should take a couple of weeks…try not to let the soil completely dry out during this time. *I think my plants to about a foot apart. They will need staking if you are in a exposed area. *Some folk start them off indoors in modules…I don’t bother…they don’t seem to do as well….and they do well from a direct sowing…so why give yourself more work? *Cornflowers will self seed if you let them…but you won’t get nice straight rows obviously…mother nature is a messy old maid sometimes….she should get an Au Pair. If you can…give them a go…you won’t be sad you did. PS Click on the FaceBook ‘like’ button below to get instant Karma…perhaps you will find five quid in a hedge…or true love in a chip shop? Grow Zinnias From Seed. How To Grow Calendula ‘Art Shades’.